Dexter Filkins has been one of the top journalists covering America's wars since 9/11 -- first for the New York Times, and since 2011 for the New Yorker -- often uncovering stories that were not welcomed by the US national security structure. But when Filkins, in a long-form New Yorker article last summer (7/20/15), took on the subject of Argentine prosecutor Alberto Nisman's untimely death and its relation to his role in indicting senior Iranian officials for a 1994 Buenos Aires terror bombing, it tested how far Filkins would go in questioning conventional wisdom. The July 18, 1994, bombing of the Jewish community center in Buenos Aires (known by the Spanish initials AMIA), which killed 85 people and wounded nearly 300, is almost always blamed on Iran in media references to the attack. Other than my own investigation of the case in 2008 (The Nation, 1/19/08), I'm aware of no journalist who has gone beyond that frame in covering it. Filkins apparently intended to write a journalistic portrait of Nisman and the disputed circumstances in which he died of a gunshot wound last January, rather than to explore the case itself. But in order to write such a portrait, Filkins had to deal with the evidence Nisman used in his AMIA indictment, and Filkins stumbled badly in writing about those issues. Filkins' failure goes to the root of a systemic problem of news media coverage of Iran and many other issues. Certain narratives about episodes and issues in recent history have become so unanimously accepted among political and media elites as to be virtually unchallengeable in media reporting. Such narratives have been repeated in one form or another for so many years that reporters simply would not think to question them for a moment, much less actually investigate their truth. The narrative surrounding the AMIA bombing and its Iranian origins is a notable example of the phenomenon. 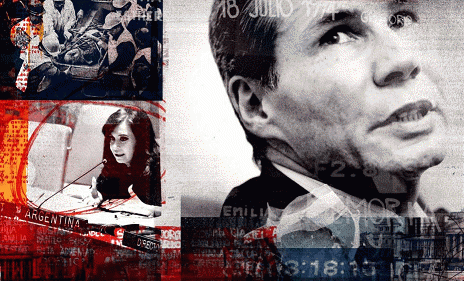 Reporting on the Argentine investigation of the bombing and the indictment of the Iranians by Nisman in 2006 has treated Iran's responsibility as an accepted and documented fact. And when Filkins believes he is adding independent reporting that corroborates Nisman's interpretation of the evidence, he actually committed errors that a careful reporter would normally have avoided. "In the course of 801 pages, he charged seven Iranian officials, including the former president, Ali Akbar Rafsanjani, and also indicted Hezbollah's senior military commander, Imad Mugniyah. 'The decision to carry out the attack was made not by a small splinter group of extremist Islamic officials,' Nisman wrote, but was 'extensively discussed and ultimately adopted by a consensus of the highest representatives of the Iranian government.' Drawing on the testimony of Iranian defectors, Nisman wrote that the decision was made on August 14, 1993, at a meeting of the Committee for Special Operations, which included the Supreme Leader, Ali Khamenei. But if Filkins had read the English-language version of Nisman's indictment, which is now available, or had done an online search on the subject, he would have learned that the sources that Nisman relied on for that spectacular intelligence claim were not "defectors," but the four members of the Mujahideen E Khalq's political front, the National Council of Resistance Iran (NCRI). The MEK, an armed opposition group, had been a terrorist arm of the Saddam Hussein regime during the Iran/Iraq War, and had carried out terrorist actions against Americans and Iranians in the 1980s and early 1990s. It was taken off the State Department's list of terrorist organizations in 2012 after a well-funded campaign to buy off prominent political and national security figures. The two MEK sources that made specific claims about the meeting were senior officials of the organization: Reza Zakeri Kouchaksaraee, president of the NCRI's Security and Intelligence Committee, and Hadi Roshanravani, a member of its International Affairs Committee. Nisman quotes from testimony by Kouchaksaraee before the Argentine Oral Court in 2003 that the decision to bomb the AMIA had been made by a meeting of the Supreme National Security Council on August 14, 1993: "This meeting lasted only two hours from 4:30 to 6:30 pm," said the MEK official. Nisman quoted Roshranravani as having testified to the same starting time, but a meeting date two days earlier: August 12, 1993. Roshranravani even claimed that the NCRI knew the exact agenda of the meeting, and that "the idea for an attack on Argentina" had been discussed during a discussion on "the strategy of exporting fundamentalism throughout the world." Neither NCRI official nor Nisman himself offered any explanation for how an exiled armed opposition organization could have penetrated the highest level of the Iranian government -- or why Argentine investigators had been unaware of such crucial alleged intelligence for nearly a decade. Furthermore, the NCRI had by then a long history of publicizing intelligence claims -- especially on alleged Iranian weapons of mass destruction -- that Mossad, Israel's international intelligence service, hoped would influence international opinion. Nisman called two other NCRI members who testified before the same court "defectors." But one of them, Ali Reza Ahmadi, was identified as an Iranian foreign service officer from 1981 to 1985, while the other, Hamid Reza Eshagi, was not otherwise identified. Those two witnesses made only joint statements, merely supporting what the senior officials of the NCRI had testified. They made no claim to independent knowledge of the meeting. A review of the indictment reveals that Nisman cited the same four NCRI members a total of 61 times to document the alleged participation of each of the seven senior Iranians for whom Nisman was requesting arrest warrants. Nearly half of the citations were for Kouchaksaraee, the head of NCRI's Security and Intelligence Committee. Filkins appears to have been unaware, however, of Nisman's reliance on the testimony of the armed opposition to the Iranian regime, with its shady history, for the crucial information on which his indictment of the Iranians was based. "Much of the testimony that guided Nisman toward the Iranian regime," Filkins writes, "was provided by a man referred to in court documents as 'Witness C'--Abolghasem Mesbahi, an Iranian intelligence agent who defected to Germany in 1996." But in identifying Mesbahi as the key source, Filkins not only misrepresents the alleged evidence in Nisman's indictment, but also demonstrates a remarkable lack of curiosity about a figure whose record as a witness on this and other cases was marked by serious anomalies and even absurdities.